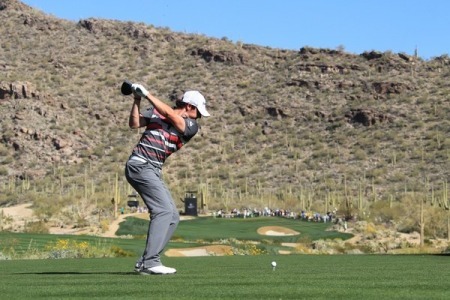 Rory McIlroy missed the chance to become world No 1 when he lost to Hunter Mahan in Tucson. Picture: Fran Caffrey www.golffile.ie Rory McIlroy insists he will not become obsessed by his quest to become world No 1. The Ulsterman missed a big chance to take over from Luke Donald at the top of the rankings when he lost 2 and 1 to Hunter Mahan in the final of the WGC-Accenture Match Play in Tucson. It almost mattered more to the reigning US Open champion that he crushed Lee Westwood 3 and 1 in the semi-finals to set up a shot at the No 1 crown. And he couldn’t resist reminding us that while he already has a major title and that his rise to No 1 is “inevitable” that that others (could he have been talking about Lee Westwood?) are still facing a far more irritating question. McIlroy said: “I’m not going to get caught up worry about it. It would be lovely to be No 1 but I’d much rather be talking about not having a No 1 spot that someone coming in saying, when are you going to win your first major, when are you going to win your first major…. “So at least I don’t get asked that question. “That for me is bigger than being asked when are you going to get to number one because if you play good golf it will come, whereas a major is a little more difficult. McIlroy has two events to play before the Masters and reckons he could still get to Augusta as the game’s top ranked player. He sad: “I’ve got two events coming up, the Honda and Doral, you know, I just you want to keep putting good results up on the board, try to get a few wins. “ And if I can do that then ultimately get into the top of the World Rankings is hopefully inevitable, if I keep playing golf the way I am at the minute. It’s a scalp he badly wanted after losing the European No 1 crown to his bitter rival in a Dubai World Championship showdown for the 2009 Race to Dubai. McIlroy explained: “No disrespect to the other two guys in the other semifinals, but it was almost my final in a way. The Holywood ace, 22, came back from three down after four, blasting seven birdies in a 10-hole stretch to cruise to a comfortable win over his former stablemate. But he couldn’t raise his game again against a brilliant Mahan until it was too late. He said: “Maybe mentally and emotionally it did take a little bit out of me. But it still doesn’t take away from the fact that Hunter played very, very solid golf. “And even though I threw a few birdies and an eagle at him in the back nine, he still responded well and held on. Since Westwood “bullied” McIlroy to win the 2009 Race to Dubai, the Englishman has endured disappointment in the majors with McIlroy going on to break his duck at Congressional last year. And by beating his Ryder Cup team mate with an epic comeback performance, McIlroy reckons he could have a mental edge if they clash with a major on the line this year. Looking forward to a potential Masters duel with Westwood in April, McIlroy said: “It could do. I think it’s just because I knew I needed to play really well to beat him. I knew I needed my best golf out there this morning to get through. “I hope myself and Lee have a lot of battles in the next few years. I think it would be great. “I was looking forward to getting out there and going head to head because in my mind he is obviously one of the best players in the world. “And he has been for the last couple of years. We had that little stretch in the mid 2000s he wasn’t playing that great. But in 1999, 2000 and 2001, he’s been a great player for a long time. 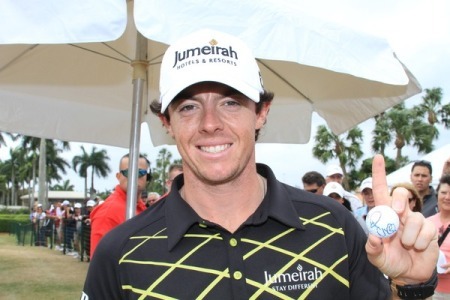 With Donald taking a break, McIlroy can still go to world No 1 by winning this week’s Honda Classic in West Palm Beach. And new world No 9 Mahan joked that it felt good to delay McIlroy’s eventual coronation as the game’s top player by taking his sixth PGA Tour victory. The hype surrounding the McIlroy-Westwood clash and Rory’s bid to become No 1 motivated Mahan to produce his best golf. Beaming, Mahan said: “ I’d be lying to you if there wasn’t. There really was. Deep down you wanted to postpone that crowning of the No 1 player in the world for Rory. “He’ll get there. I mean he’s phenomenal. He’s really talented. He’ll be No. 1 eventually. I’m not worried about it. I’m sure he’s not. “But, yeah, for sure, when you’re a player and I listen to Johnny Miller and Nick Faldo and all those guys, they had him picked to win, there was absolute motivation in that. 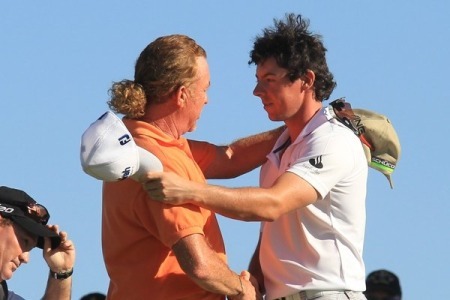 Rory McIlroy was touched by Miguel Angel Jimenez’s warm congratulations after their third round match. “He was very nice. He’s one of the most popular guys on Tour and everyone likes him. Yeah, he’s a gentleman and I appreciated that.” Picture by Fran Caffrey/www.golffile.ieRory McIlroy remained on course to become Ireland’s first world No 1 and smash two of Tiger Woods’ records when he battled his way into the quarter-finals of the WGC-Accenture Match Play in Arizona. Lee Westwood shakes hands with Rory McIlroy on the 17th following his 3 and 1 defeat. Picture by Fran Caffrey/www.golffile.ieRory McIlroy confessed that his massive desire to beat Lee Westwood ultimately cost him the WGC-Accenture Match Play and the chance to become Ireland’s first world No 1 last night. Rory McIlroy celebrates his Honda Classic win and move to world No 1. Rory McIlroy was on top of the world last night after he held off a dramatic final round charge from Tiger Woods to become Ireland’s first number one. World No.1 Rory McIlroy at Doral on Wednesday. Photo Eoin Clarke/www.golffile.ieNew world No 1 Rory McIlroy is relishing the bullseye on his back. Getting to the top of the rankings as been a burden for players in the past but McIlroy is happy in the spotlight and insists he has no intention of giving up top spot any time soon.